Thank you for your interest in the Wharton Global Alumni Forum in Lima, Perú. 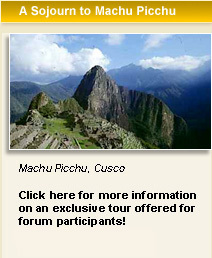 This is the official website of the Lima Forum, one of three such Forums that Wharton will hold in 2008 to celebrate and strengthen the global alumni community. All Wharton alumni worldwide are welcome and encouraged to attend any or all of the three Forums in Lima, Perú, Ho Chi Minh City, and Cape Town, South Africa. Through this website you can learn about the program, its content, and the theme of this Forum, which is “New Directions for Latin America.” You can also register for the Forum, reserve your hotel room, see a list of who else has registered, and send e-invites to your friends. All the links you will need are available on this home page. Please remember that this is a dynamic website, and it will change weekly between now and the start of the Forum on March 12, 2008. We encourage you to register immediately, but to revisit the site periodically for updates on the schedule, speakers and other details.